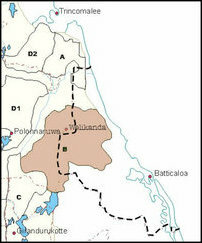 SL Mahaweli Ministry, which is led by SL President Maithiripala Sirisena, has schemed a major Sinhala colonisation programme targeting the pasturelands of Eezham Tamils in two administrative divisions of Paduvaankarai region in Batticaloa district, informed civil sources at Batticaloa District Secretariat told TamilNet this week. While 320 Tamil dairy farmers from the two divisions of Ea'raavoor-pattu (Chengkaladi) and Koa'ra'laippattu South (Kiraan) are already struggling without adequate pasturelands for their cattle, SL Mahaweli ministry has sketched out a new plan to distribute 49 acres per Sinhala colonists through a leasing programme. The overwhelming majority of the recipients are Sinhala farmers, initial reports said. The programme, if allowed to be implemented, would be one of the disastrous Sinhala colonisation schemes in the district, the sources further said. The dairy farmers in Paduvaankarai region were struggling for several years against repeated attempts of colonisation since the end of war in 2007 in the East. The Tamil farmers finally managed to dismantle some of the colonisation schemes only last year. But, it seems to be a short-lived pause. The SL regime, which was documenting to visiting UN officials that it had dismantled the colonisation schemes in Paduvaankarai, has now planned a new scheme to seize the lands again. The programme is to be rapidly implemented in January 2018, the sources further said. Now, even legal action would not be possible as SL Mahaweli Ministry would be using its authority under the genocidal ‘development’ agenda to lease out the lands, Tamil dairy farmers complained. This is also an attempt to deprive the Tamil farmers of one of their prime source of livelihood in the district, they said. 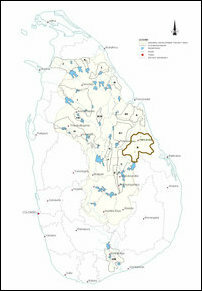 Lands are distributed under island-wide population ratio through Mahaweli scheme. The provincial councils have no say in the development programmes run by the unitary State mechanism. According to the so-called ‘national ratio’, ethnic Sinhala-Buddhists constitute 69%. When it comes to Mahaweli system 96% of the beneficiaries have been Sinhalese in the past. Tamils who constitute 16% (Tamils from North-East 12% and Up-country Tamils 4%) were given only 1.5% of lands. Tamil-speaking Muslims, who stand for 8% of the ethnic ratio, received only 2.5%. The federation of dairy farmers in Paduvaankarai is planning to launch agitations against the move, the representatives of the farmers said. The Liberation Tigers of Tamil Eelam defended Paduvaankarai for a long time from Sinhala colonisation.